The Hawaii Big Island Photo Gallery has my Hawaii vacation photos of Kona, Hawaii, Kilauea Volcano, and other photos of Hawaii. These were taken on a vacation in March 2006. The goddess of Kilauea Volcano is called Pele, people often leave offerings to Pele. 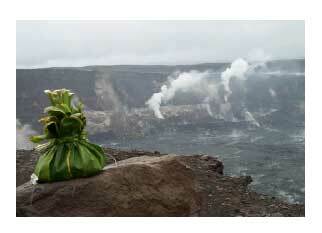 This offering is on the edge of the smaller Halema'uma'u Crater, home of Madame Pele. Kilauea Volcano is not like many other volcanoes; it is not triangle-shaped, and does not spew lava from the top. The volcano is a more rounded mountain, and the lava flows push out the sides of the volcano. There are steam vents in the craters at the top of the volcano, through holes in the hardened lava. But the surface is still much too hot and unstable to walk over. The sulfur fumes can be quite overwhelming at times. 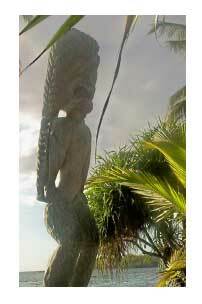 The Place of Refuge (Pu'uhonua o Honaunau) was a sanctuary for lawbreakers and other outcasts from society. The only way to get to the Place of Refuge was to swim treacherous waters; those who survived were forgiven their transgressions and allowed to stay in peace. There are a number of carved wooden statues that "guard" the Place of Refuge. 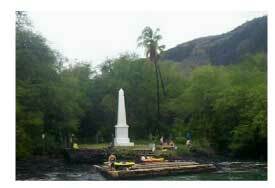 The Captain Cook Memorial, on the shore of Kealakekua Bay, is technically on British soil! You can stand near the memorial and have a foot in the U.S. and a foot in Britain. Kealakekua Bay is a great place for snorkeling. We took the Fairwinds snorkel tour - I highly recommend it, especially in the morning! We saw a lot of fish, and I even saw an eel! 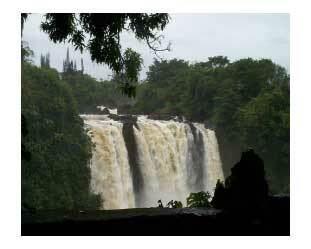 There are many waterfalls around the Big Island of Hawaii; this is Rainbow Falls in Hilo on the south-east coast of the island. 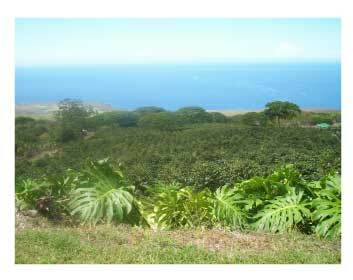 Some of the best coffee in the world is Kona coffee - the coffee grown along the Kona coast of the Big Island. I don't know what it is about this coffee, but it's smooth and rich and unbelievably good!